The Two Dollar Tattoo Project: These little tattoos can heal, here is proof! Congratulations Canada On Dominating Olympic Hockey! 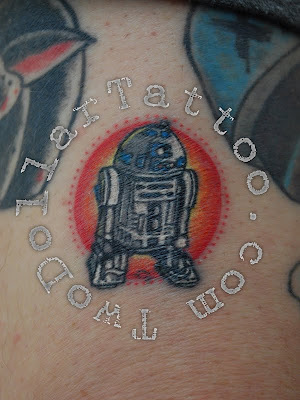 "I included a photo of the R2D2 that I did, completely healed. Only took 4 days to heal. We'll see how it looks in ten years, HA!" Now, if we all ran around worrying about what actions we take now and how they might effect us in ten years I don't believe we would be nearly as much fun as we proclaim to be... people would be a lot less likely to get good fun tattoos and where would this project be then? It is true tattoos age, though the aging process they can fade, soften, or just change in shape. The truth is we all will age and eventually fade, soften and change shape to match our tattoos to some degree. My suggestion is live a little, do what you like and Get Good Tattoos! If you don't like the tiny memento of your favorite Sci-Fi character you received a decade prior there will always be an artist willing to cover up that rusty old R2D2 tattoo with a fresh new Imperial Death Star. I will have more proof of healed Two Dollar Tattoos shortly. As well we all know Star Wars fans love a good prequel there is more Star Wars Two Dollar Tattoos coming this week, STAY TUNED! Awesome to see the nicely healed finished product! Even better healed. This is often the case with these, I'm finding.